Why should I apply for the Master of Advanced Studies in Transitional Justice, Human Rights and the Rule of Law (MTJ)? What Distinguishes the MTJ from the two other master programmes offered at the Geneva Academy? Does the MTJ offer practical work experience with leading actors in the field? Do you offer scholarships for the MTJ? What job opportunities are available after I complete the MTJ? Can I do a PhD after I complete the MTJ? Is it possible to attend some individual courses of the programme and get a certificate for this? Does the MTJ offer distance-learning courses? Is it possible to take part in an exchange programme abroad during the MTJ? Which degree will I receive after successfully completing the MTJ? What are the criteria for admission to the MTJ? I want to apply for the MTJ but have not yet completed my current degree. Will you consider my application? What are the costs of living in Geneva? Transitional justice is a well-established, multidisciplinary field of academic inquiry and practical policy-making. It examines how societies that emerge from periods of civil war or oppressive government can deal with the legacy of human rights (HR) abuses. In theory and practice, it focuses on practical measures and mechanisms such as criminal prosecutions, truth commissions, reparations and institutional reform, including post-conflict rule of law building (See, for example, the UN Secretary General’s report on the rule of law and transitional justice). The Geneva Academy is a leading research and education institution in the field of transitional justice. Students enrolled in our Master of Advanced Studies in Transitional Justice, Human Rights and the Rule of Law (MTJ) programme are taught by leading academics and practitioners. We have developed close collaborations with Geneva-based agencies active in the area of transitional justice, human rights and the rule of law. We regularly welcome their experts at events, policy discussions and taught sessions. Thanks to these collaborations, our MTJ programme offers several of our students research internships and networking opportunities, which allow them to gain practical experience and make useful contacts for their careers. Our MTJ is a unique and innovative programme that combines high-level academic education and real-world practice which allow students to gather first-hand experience and practical knowledge of different facets of transitional justice, human rights and the rule of law. Primary focus is placed on strengthening interdisciplinary knowledge and preparing students for future professional activities in the expanding field of transitional justice. During the Spring Semester, three different tracks – Thematic Focus, Clinical Work or Academic Research – allow students to pursue their particular interests. Throughout the year, our students also have access to a rich network of experts and practitioners. They also receive individual guidance and one-to-one counselling by means of academic mentoring and career coaching. The Geneva Academy proposes three distinct master’s programmes: a Master of Advanced Studies in Transitional Justice, Human Rights and the Rule of Law, an LLM in International Humanitarian Law and Human Rights and an Executive Master in International Law in Armed Conflicts. During the Spring Semester, students can choose the Clinical Work Track and be selected to carry out research internships with prominent actors such as the Office of the UN High Commissioner for Human Rights (OHCHR) and the International Center for Transitional Justice (ICTJ). Exchanges with leading expert during the Transitional Justice Cafés and the Transitional Justice in Practice course also allow our students be exposed to and deal with practical situations and have in-depth discussions with leading experts and practitioners in the field of transitional justice.  The Geneva Academy offers a number of full scholarships (covering tuition fees and living expenses in Geneva for ten months) and partial scholarships (covering tuition fees). The MTJ combines theoretical knowledge with practical work. It thus provides a solid foundation for careers in transitional justice with international organizations, NGOs, international courts and tribunals, development agencies, governments and academic institutions. During the year, our students have access to a rich network of experts and practitioners. They also receive individual guidance and one-to-one counselling by means of academic mentoring and career coaching. Furthermore, they can use the Careers Service of the Graduate Institute of International and Development Studies. In the Spring Semester, our students may be selected to undertake an extended masters paper, which involves increased supervision and mentoring and participation in academic activities. This track is particularly suited to students with an interest in pursuing a PhD or further research after the programme. Professionals or academics who are not enrolled in the MTJ programme can take short courses to deepen their expertise in a specific issue. The Spring School, a special one-week course organized to discuss cutting-edge issues in transitional justice, is also open to external participants. Attending these courses gives participants the opportunity to draw on the comprehensive expertise of the Faculty, meet key experts and practitioners, and interact with students. The MTJ is a full-time programme and no distance-learning courses are offered. The MTJ is a one-year programme and does not provide for exchange programmes. Master of Advanced Studies (MAS) in Transitional Justice, Human Rights and the Rule of Law (60 ECTS credits), awarded by the University of Geneva and the Graduate Institute of International and Development Studies. We are looking for students who possess a law degree or an equivalent degree relevant to transitional justice (such as international relations, political science, sociology, anthropology or history); have a demonstrable interest in legal issues related to transitional justice and are proficient in English. Practical experience and a command of French are an asset. You may apply for the MTJ during the last year of your degree. We will consider and assess your application based on a current transcript and grades obtained so far. If we offer you a place, it will be conditional and you must send your final results and evidence that your degree has been awarded as soon as these become available. The final decision will depend on whether you meet the specific requirements (minimum grades) that the Admissions Committee sets. Previously unsuccessful candidates can reapply. This will not have a negative influence on the selection process. Students should consult the nearest Swiss embassy about the procedure. Because the visa process may take several weeks to a few months, students should apply to the nearest Swiss embassy as soon as they have been admitted to the programme. Every week, events organized by the Geneva Academy, the Graduate Institute of International and Development Studies, the University of Geneva, international organizations and NGOs feature leading experts in the area of transitional justice, human rights and the rule of law. These events directly touch upon topics addressed in the programme. As the MTJ is a full-time intensive programme, we would not advise our students to find intensive employment that might interfere with their academic performance. Students of the MTJ can extend their residence permit for up to six months following the completion of the programme (July to December) to undertake an internship or a temporary assignment related to their studies in a Geneva-based institution, and/or to look for a job in Geneva or Switzerland.